The Jeep Wranglers are notoriously known for their lack of storage space. I am known for my organizational skills. 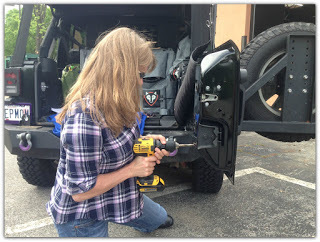 I have tried many different solutions for storage in my Jeep. Below are my Top 5 favorite storage solutions. I love it because of all the colors they come in, 11 signature TrailMesh colors. Even purple. It's an easy access pouch that Velcros to your "glovebox" handle. 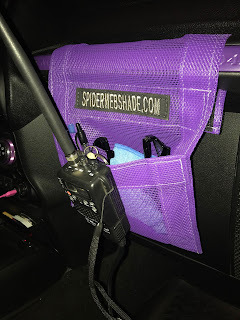 This is where I clip my handheld walkie talkie when I'm off road. This is great if you have younger kids, they can store all their stuff in the molle bags. I like to keep my "Grab and Go" items here; like a first aid kit, winter hat and gloves etc. They come in all sizes and styles. These are great to store all my Jeep gear. Both Blue Ridge Overland Gear and Justice Off Road carry these bags. panel and the inner fender can be used too. Perfect for organizing all your off road needs with easy acess. It is a simple easy install as well.